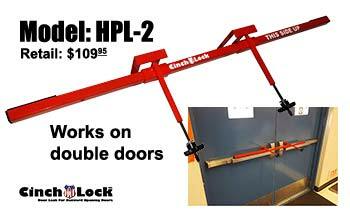 Locks for doors that open outward - Temporary Door Lock fits over door handle or Panic/Safety Bar. 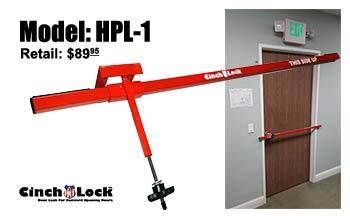 CinchLock-HPL1 classroom door lock is strong, quick & easy to install and simple to remove. It provides an added level of security and safety to your classroom, keeping both teachers and students out of harms way. 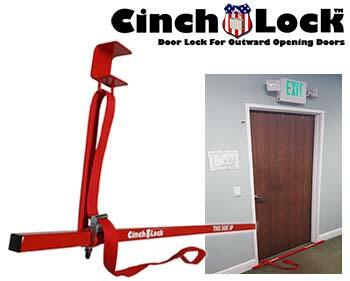 The CinchLock classroom door lock is strong, quick & easy to install, and simple to remove. It provides an added level of security and safety to your classroom, keeping both teachers and students out of harms way.